Formation Flying is precision flight at it's finest. Formation Flying - Challenging and Fun! 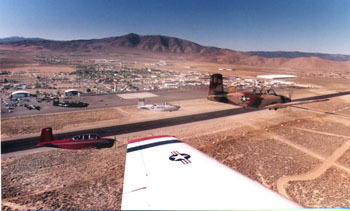 Throughout the years, I've had the opportunity to fly various aircraft with the most hours logged in a T-34 Mentor and my Cessna Turbo Stationaire. While flying the Mentor, I learned to fly formation. After many months of practice, I passed the T-34 Association’s formation test, acquired my Wingman’s patch, and flew in a warbird formation at the Oshkosh Airshow…an experience that I will never forget. It’s one thing to fly in a two or three ship formation. 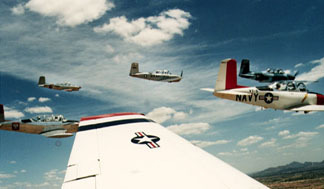 It is another to fly in a formation with 10 or more other aircraft, especially on a hot summer day. Turbulence, combined with multiple wing vortices and the effects of “centrifugal force” on a formation that’s 200+ feet across, creates an interesting and enjoyable challenge. 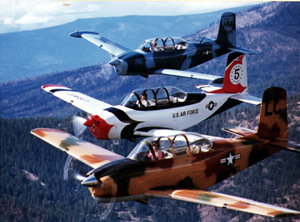 Non-military pilots seem to have varied opinions of what determines a formation flight. For some, the spacing is so far apart that we nicknamed it a "Same Sky, Same Day" formation. In those cases, the planes were so far apart that they would literally lose each other. Not having military training, I was weaned by the rules of the T-34 Association - some of whom, were military trained. When learning to formation fly, the tendency is to grab onto the stick so tightly that your knuckles turn white. Eventually you learn to relax, and that is when you do your best flying. When done correctly, the movements are very subtle when in straight and level flight or gentle turns. The hardest practice was lazy eights. If you weren't absolutely on top of it, you would quickly get left in the dust. I was comfortable with steep turns, but never mastered a formation loop as is done by the Lima Lima Formation Demonstration Team. Since most of the pilots that fly in the Oshkosh warbird formations are civilians, it is required that each one has been trained, tested and issues a formation wingman's patch. It is a safety issue and helps assure the pilots that the guy who is flying on his or her wing has been trained to do so. Bill Cherwin, the leader of the Lima Lima team, was who tested my skills during a formation check out and upon passing, gave me a wingman's patch which one I choose and covet to this day. Once in a while an ex-fighter pilot would join the group and would give us lessons in dog fighting. One of these was Craig Morrison. He was one of the Ravens - the pilots that were on a "secret mission" in Laos fighting the Vietcong. They were a renegade bunch. Some would fly low level in Bird Dogs trying to solicit gunfire from the jungle. Once they were shot at, they would pinpoint the gunner site and call in the T-28's to bomb the enemy. I was invited to a Raven gathering/party and I could still see the renegade spirit alive in every one of them. Craig taught me some basic dog fighting tactics...as best as is possible in a T-34. The one I was flying had a IO-520 with 285 HP, so it wasn't quite a bad as the ones with original 225hp engines. During training, I recall a situation when the pursuing aircraft was on my tail. I was pulling the stick in an attempt to lose him and began getting tunnel vision or some call it "graying out". I knew that if I didn't release the stick, I would lose my sight as the G forces were squeezing all of the blood out of my upper torso and there was also the chance of an accelerated stall. I also knew that if I DID release the stick, I would theoretically be shot down. It gave me a tiny little taste of the plight of a fighter pilot. At that moment, I was very happy that it was just a game and especially thankful for the REAL fighter pilots who have put their lives at stake for our country. Above Left: Lead: Lynn Conklin - Flew C-5's in the military and currently flies for a major airline. Center: Ramona Cox (Skychick) - Licensed for 18 years - all pleasure flying. Right: Joyce Mills (Midget) - Flew her Bonanza to Los Angeles daily to work as an emergency room nurse. 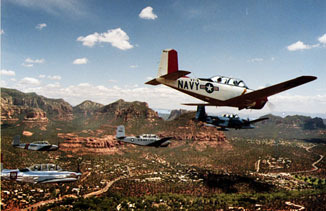 One of the benefits of formation flying is the camaraderie of gathering with your friends and practicing your skills. We would always have a pre-flight briefing and would debrief after each flight. We helped each other with suggestions, discussed safety issues, compliment those that did great and yanked on those that didn't...typical "no-slack" guy stuff. I enjoy talking with kids about flying and letting them try it for themselves. I've found that the less I say, the better they do. Like anything, some are naturals at it and some are not. They seem to relate to me instantly since we are usually eye to eye, or in some cases, I'm looking up at them. 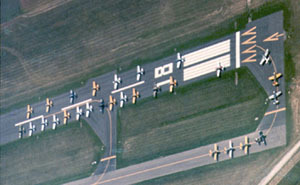 Below: Formation practice at Fondulac in preparation for flying in the the EAA Airventure, Oshkosh Airshow. I'll be adding more photos. If you have some formation photos you would like to share, email them to me and I will add them to the site. In the meantime, Happy Flying!! !